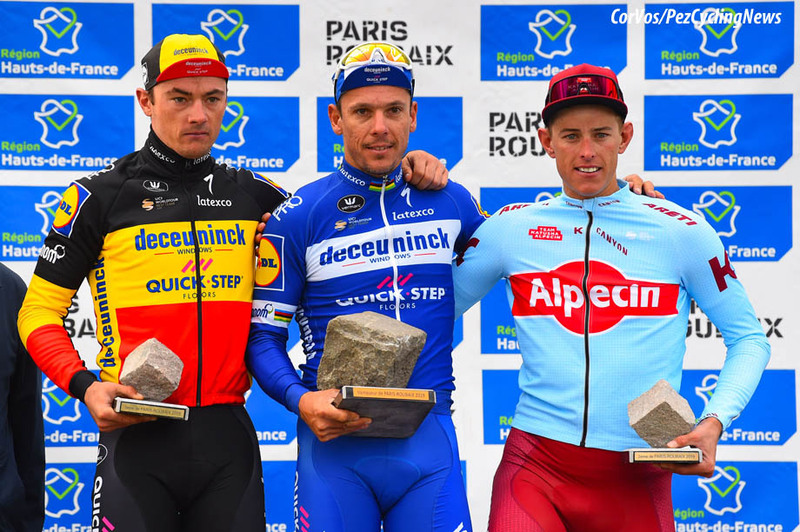 PezCycling News - What's Cool In Road Cycling : PARIS-ROUBAIX’19: Glorious Gilbert Conquers the Cobbles! 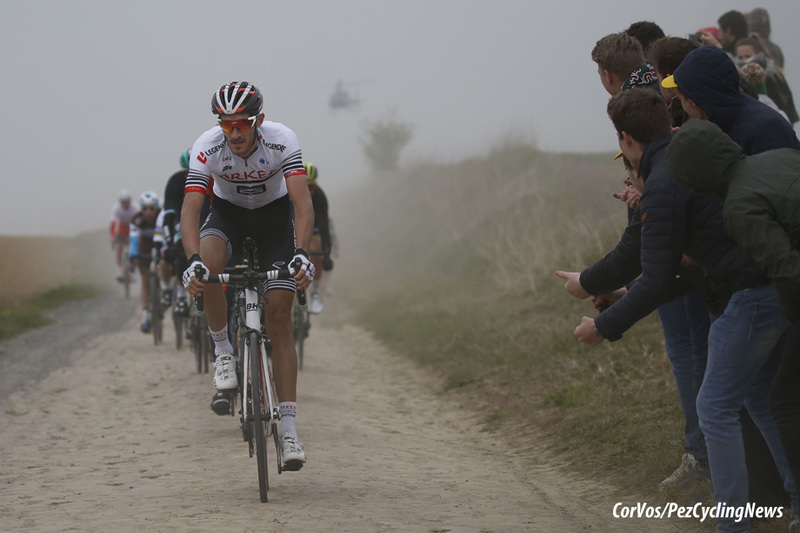 PARIS-ROUBAIX’19: Glorious Gilbert Conquers the Cobbles! 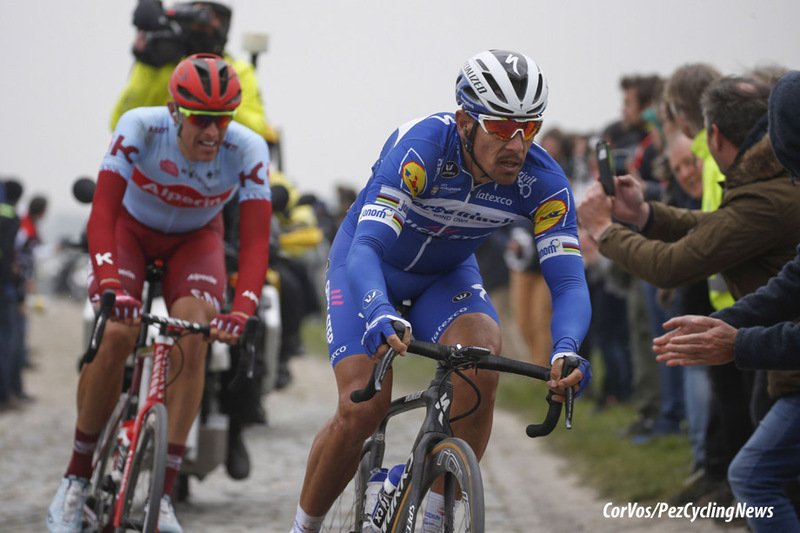 Race Report: On a cold day of gruelling, unrelenting speed it was Deceuninck - Quick-Step reminding the doubters why they are the world’s best team; with Belgium’s Philippe Gilbert first over the line and team mate and countryman Yves Lampaert third, it was emphatically their day on the Roubaix velodrome. 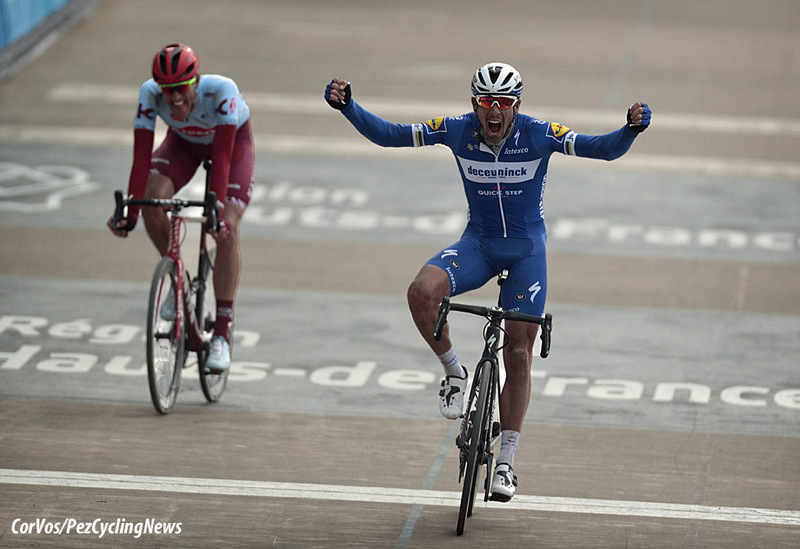 They also took fifth with Frenchman Florian Senechal and seventh with Czech Zdnek Stybar. 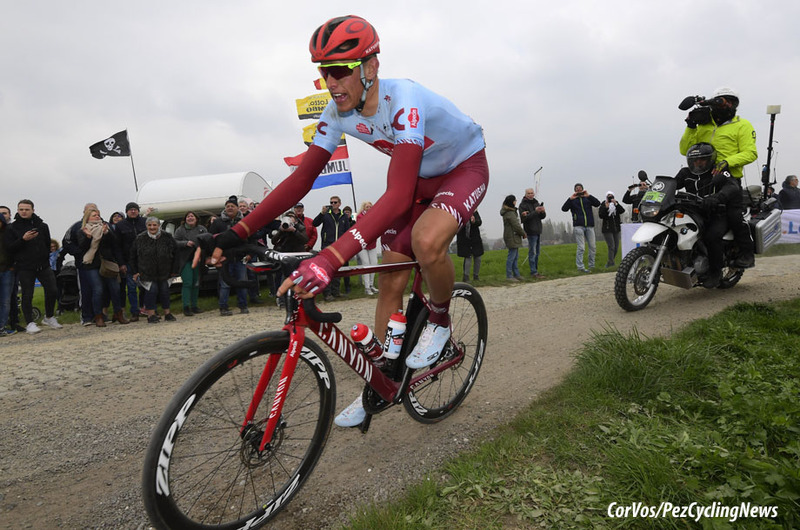 Plaudits to Germany’s Nils Politt (Katusha-Alpecin) who took second after having worked hard from the start. World Champion Peter Sagan spectacularly ran out of gas and kudos goes to Delko Marseille’s Evaldas Siskevicius Lithuanian taking ninth. 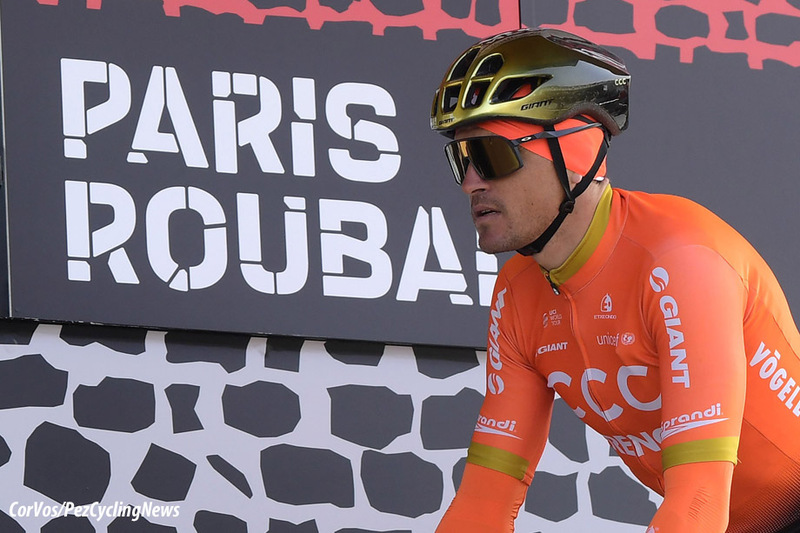 Leg warmers, arm warmers, gillets, balaclavas, gloves, it could be a Sunday run – albeit a very fast one as every attempt to ‘get in the break’ was snuffed out before we had a chance to write names in our note books. And none of the aggressors will be getting those watts back any time soon. It was 40K in before two persistent beggars got a gap of some 20 seconds - Messrs. Mads Pedersen (Trek-Segafredo and Denmark) and Marco Marcato (UAE Team Emirates and Italy) by name. But two man break + feisty peloton + headwind + exposed, straight roads, does not = ‘fun’ if you’re one of the two desperados. 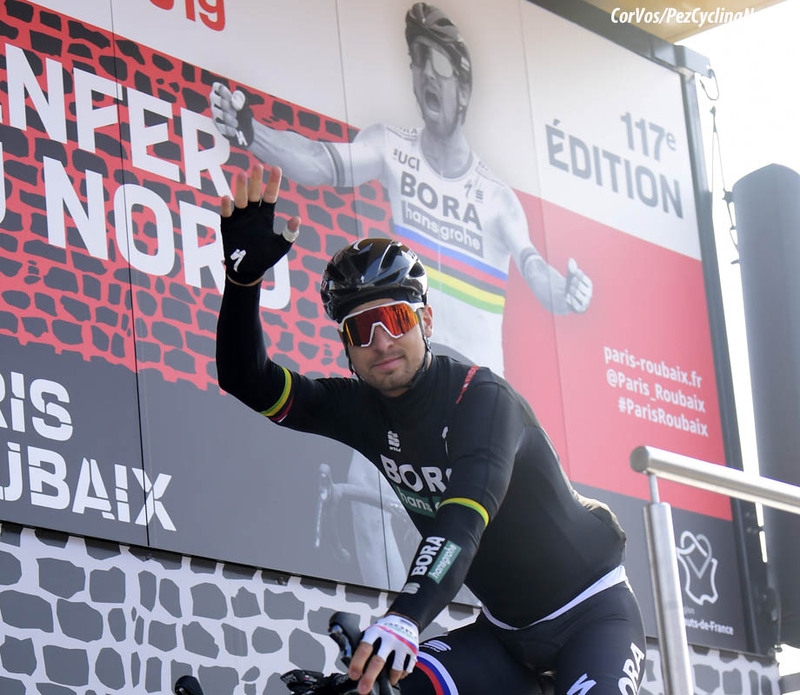 Mads says ‘ciao’ to Marco, who engages reverse and ‘ciao’ to last year’s ‘man of the match’ Silvan Dillier (Trek-Segafredo and Switzerland) who comes up to bang his head against the wall on behalf of German team mate and former winner, John Degenkolb. But no dice. Compatto as we approach the 200K mark. 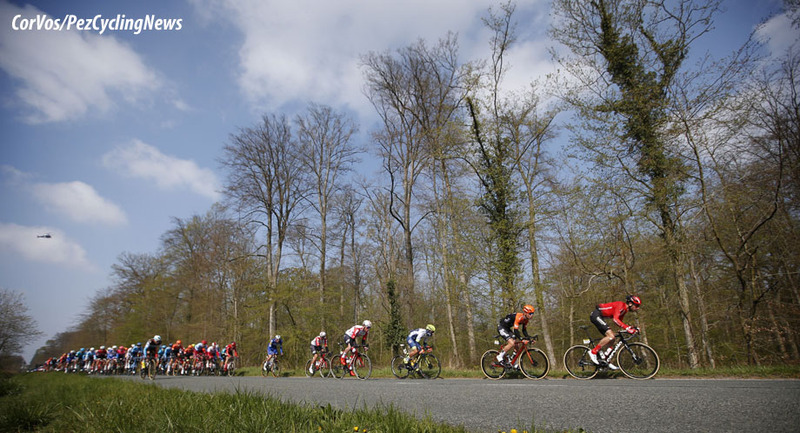 But just inside the 200K mark we have three away: Jurgen Roelandts (Movistar and Belgium), Casper Pedersen (Sunweb and Denmark) and Mads Wurtz Schmidt (Katusha-Alpecin and Denmark) – they get the gap up to 30 seconds; the best margin of the day so far. 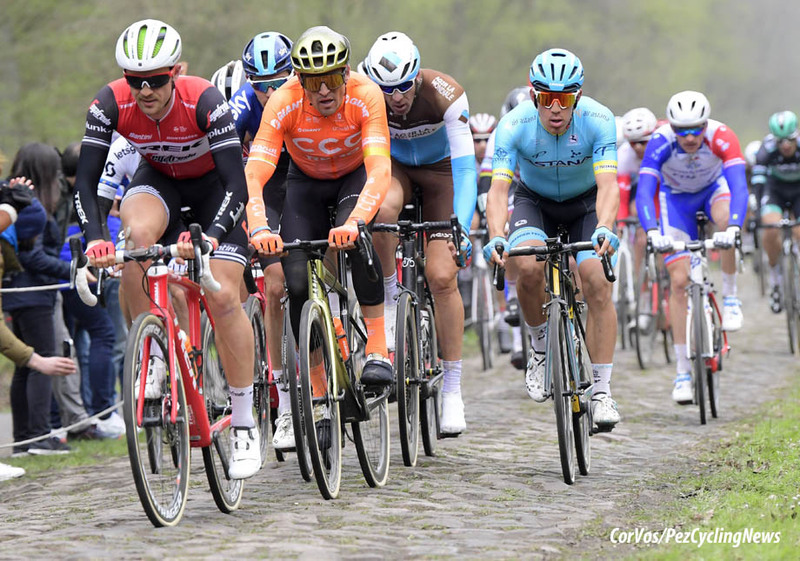 But that gap is not going to ‘yawn’ – the peloton are in a stingy mood today and that long, long line of riders in the gutter tells us all we need to know about the speed. Despite the head wind, the race is two minutes up on the fastest schedule in the race manual . . . and the escape is no more. Compatto. A decent group, seven/eight has gone clear around 20K from secteur 29, recent Circuit de la Sarthe winner Alexis Gougeard (AG2R-La Mondiale and France) is in there. As is that big bear of a man, Damien Gaudin (Total-Direct Energie and France) – and it’s split behind in the wind. Sky meanwhile lead the peloton at 42 seconds on the head of the race, Knees, Doull burning watts early. Matteo Trentin (Mitchelton-Scott and Italy) and Nils Politt (Katusha-Alpecin and Germany) are in the group in the middle. 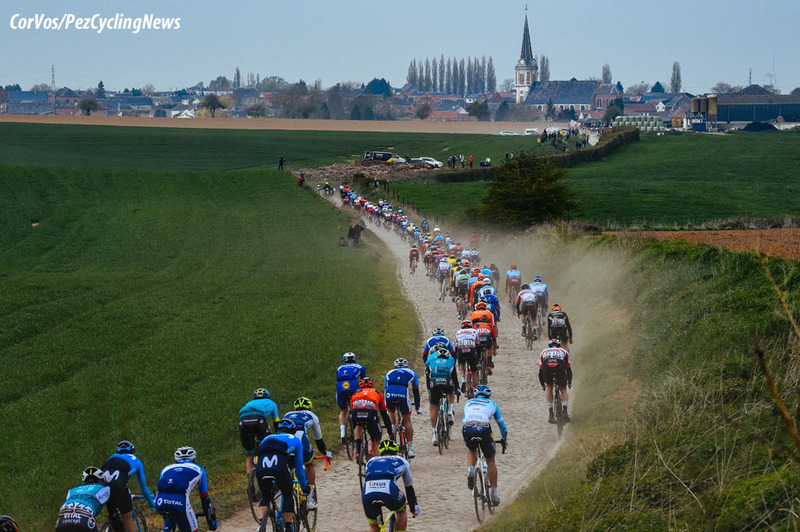 We have NINE up front then: Jorge Arcas (Movistar), Michael Schär (CCC), Damien Gaudin (Direct Energie), Frederik Backaert (Wanty-Gobert), Alexis Gougeard (AG2R-La Mondiale), Kris Boeckmans (Vital Concept-B&B Hotels), Bert Van Lerberghe (Cofidis Solutions Credits), Frederik Frison (Lotto Soudal) and Michaël Van Staeyen (Roompot-Charles) with 39 seconds on the peloton as Secteur 29 looms. The race proper starts as the break hurtles into 29 with the split and peloton in hot pursuit. The split catches the break, so 20 or so up front; add to the names above - Kamil Gradek (CCC Team), Edward Theuns (Trek-Segafredo), Matti Breschel (EF Education First), Nils Politt, Marco Haller (Katusha-Alpecin), Tim Declercq (Deceuninck - Quick-Step), Stefan Küng (Groupama-FDJ), Jasper Philipsen (UAE Team Emirates), Davide Ballerini (Astana), Renardt Janse van Rensburg (Dimension Data), Cees Bol (Sunweb), Maciej Bodnar (Bora-Hansgrohe), Yves Lampaert (Deceuninck - Quick-Step), Adrien Petit (Total-Direct Energie) and Danny Van Poppel (Jumbo-Visma). 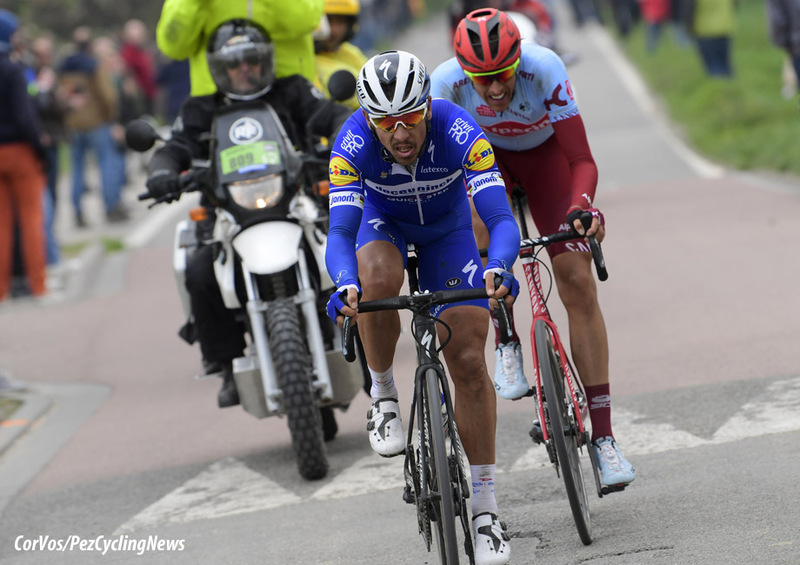 It won’t have been missed by many that there’s a Deceuninck duo in there – a good situation for them. 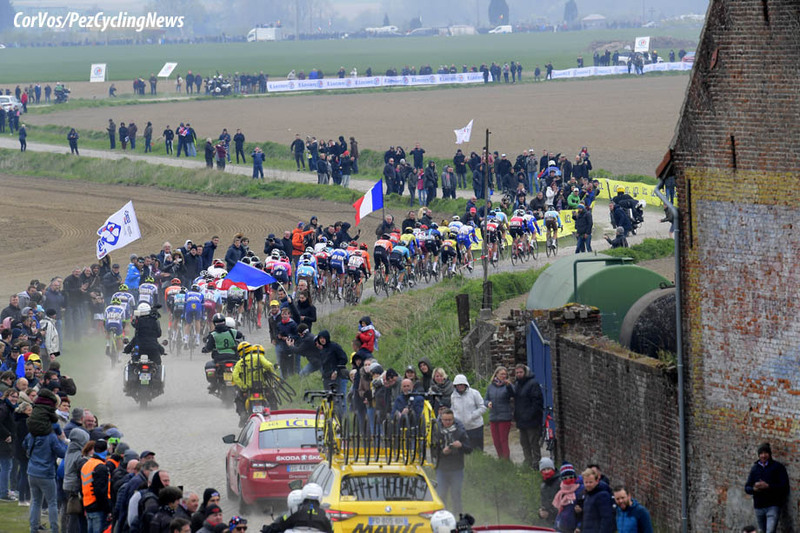 Secteur 28, four star, three K plus – Lampaert leads the break. Break and bunch clear the secteur with 50 seconds between them. Secteur 27 pops up immediately with Declerq on point. 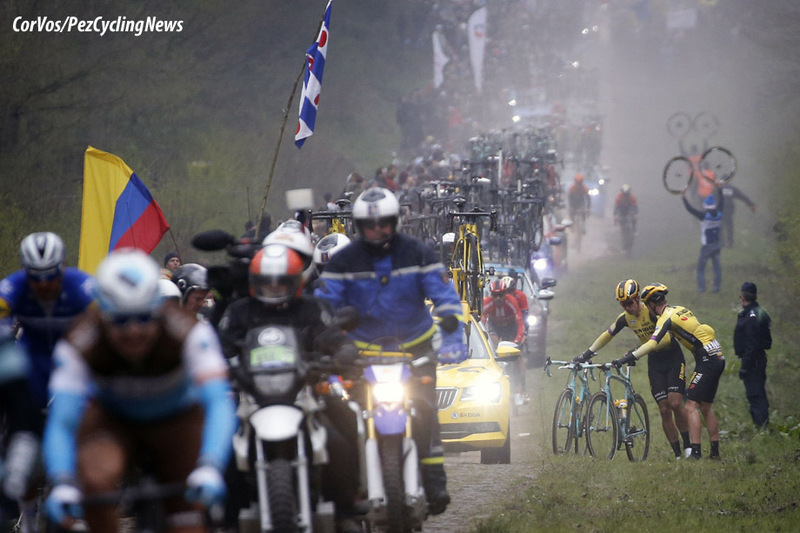 And in no time it’s secteur 26; the longest of the race, 3700 metres, four star – ouch! 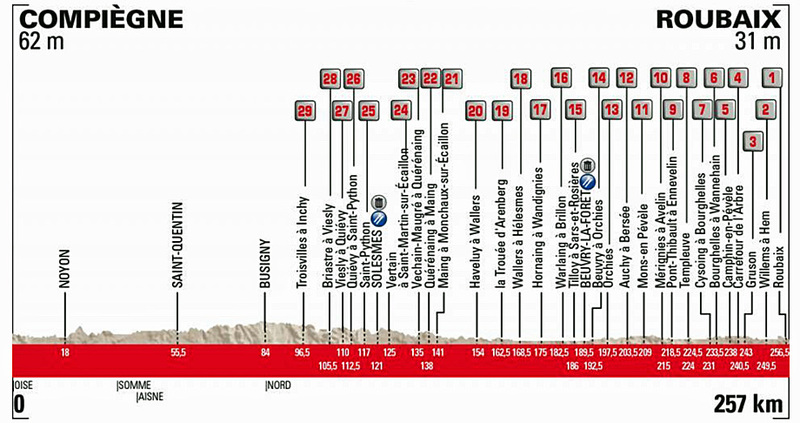 The gap back to the peloton is creeping up to the minute mark; Jumbo-Visma head the bunch, WVA is a big favourite today. Talking of favourites, Kristoff chases back from a puncture - as Trentin has to change a rear wheel. Kung leads them out of 26 as Trentin changes his rear again, this time with a team helper. Greipel has punctured and is trying to fight back as the break rides in Secteur 25, that’s 1500 metres, two star with Politt now at the front. Secteur 24 now as the lead slides back to the half minute. This one is three star, 2300 metres in length with Jumbo and Bahrain tugging the leash on the escapees. A Jumbo goes down – ouch! Out of 24 it’s looking like it’s going to become a big, happy family again – but no, it’s a committed group and determined to drive on, with Declerq ‘doing his thing’ to keep the gap. 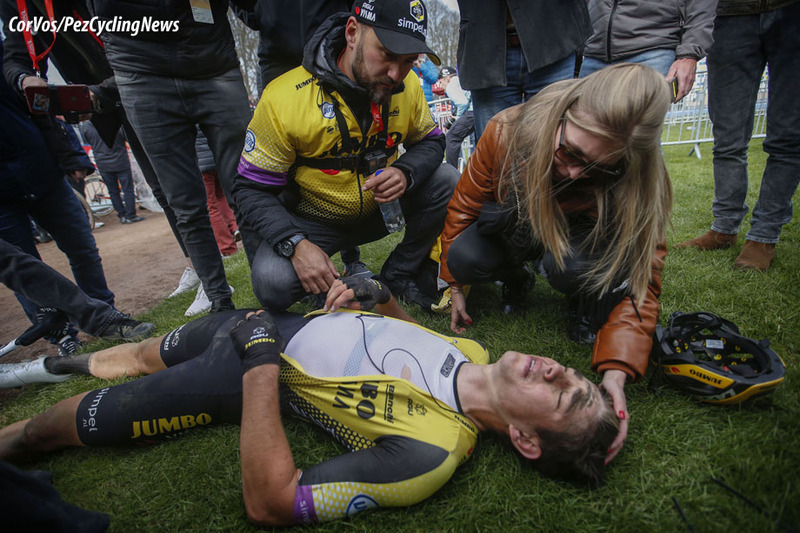 In the peloton there are crashes and punctures, too numerous to list – coupled with the speed, this is one tough day. ‘Only the Strong’ will survive this day at the office. Secteur 23 and it’s compatto over these 1600 metres with what passes for a lull as they clear it. Next up is Secteur 22 at 2500 metres with a Wanty sneaking away. He looks back; ‘they’re still there, amigo. . . In the front we have Rowe and Van Baarl for Sky; Stybie is there too, WVA, GVA – meanwhile Polish Bison Bodnar drops back from the leaders to locomotive the chase for his boss. A Deceuninck is down! Asgreen? – no, it’s Iljo Keise. He caught a traffic island – ooow! 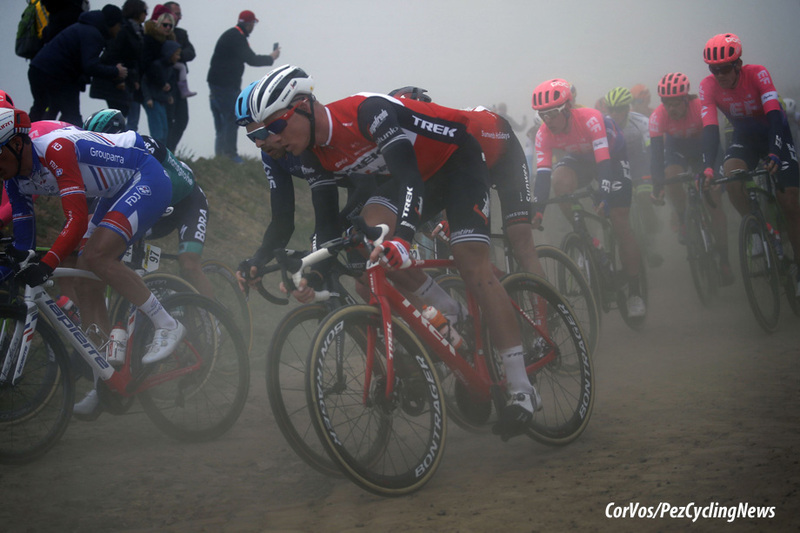 GVA’s boys have been on the front of the lead group but it’s going to come back together for Secteur 20 – with 19, of course, the dreaded Forest of Arenberg. 20 is 2500 metres; and it’s very physical as they drive into it – no quarter asked or given. Haller leads into it for Politt with the next one key in this race. Senechal’s tsunami looks to have ended Kristoff’s chances – his group is two minutes back. And there are the big Arenberg Colliery winding towers, Guardians of the Galaxy of danger and pain that lies between the trees of the Arenberg Forest. Naesen, Degenkolb, GVA, WVA, Stybie, Sagan, Lampaert are all there – only Kristoff is missing. They exit 18 and WVA makes it back. Groupama-FDJ are there in numbers, a Demare win? Too much to hope for? He’s been sixth and 12th in the past. 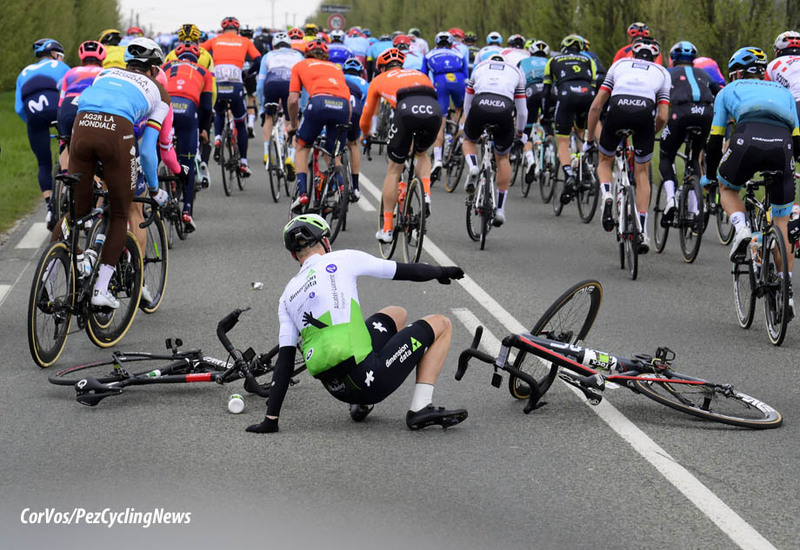 WVA meanwhile changes bikes and immediately drops it, maybe lube on the tyre – not a bend where you’d expect him to slide out? 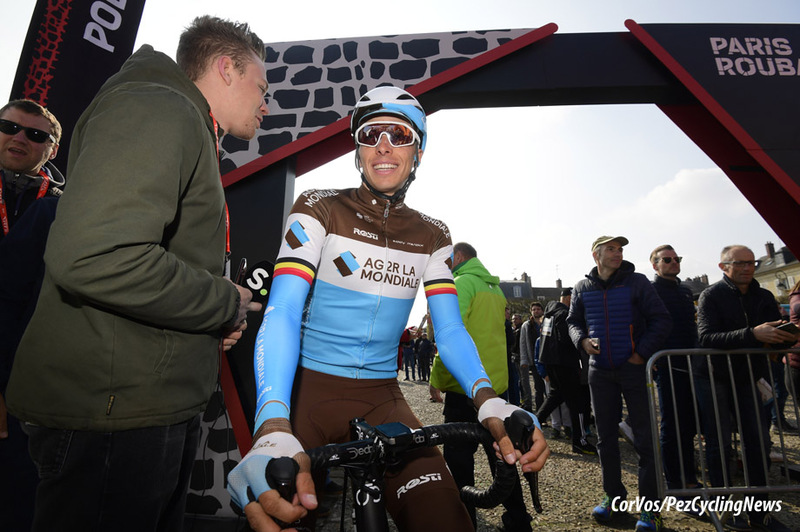 AG2R set the pace now, Naesen must feel good? 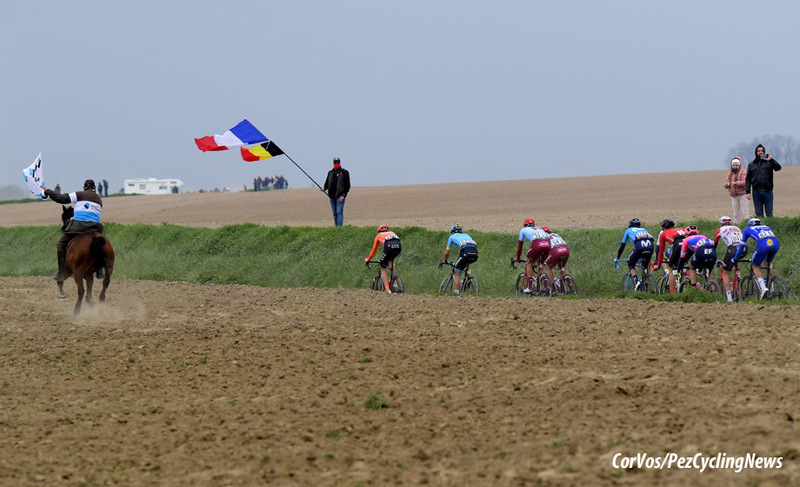 Secteur 17, a long one at three K plus as WVA tries hard to get back – but he’s a minute down? The peloton exits the Secteur but it’s 1:12 before WVA passes the same point – it looks bleak for him. 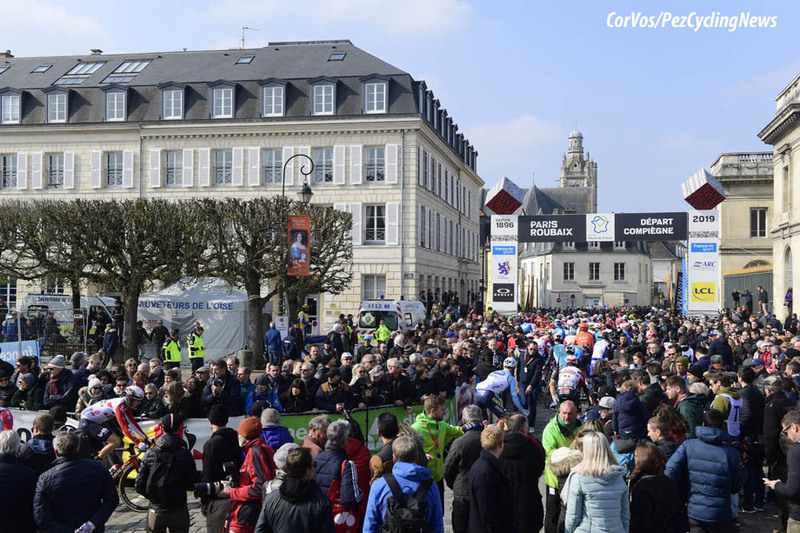 The peloton is down to around 50 now with four up the road, Wesley Kreder (Wanty-Gobert), Cyril Lemoine (Cofidis), Raymond Kreder (Wanty-Gobert) and Anthony Turgis (Total Direct Energie). Secteur 16 at 2400 metres, three star with Senechal leading the bunch. Vandenbergh leads now - he terminates three of four breakaways but Kreder persists, whilst the remarkable WVA makes it back – wow! Secteur 15, 2400 metres, four star; Vandenbergh is on fire as Burghardt (AG2R) heads into the greenery and goes down. Lotto’s Benoot is out, he crashed into the Jumbo car. Kreder is still clear as the peloton has a breather out of 15 on smooth tarmac. I should have said ‘brief’ lull. . .
Theuns lines it out for Degenkolb as they approach Secteur 14. Politt attacks through the feed zone, Gilbert marks him and the big German takes them up to Kreder with Bora man Selig along for fun. The four enter Secteur 14, 1400 metres with the four fugitives 15 seconds clear; Gilbert drives. Trek lead the peloton as the four exit 14 as the lead eases out to 25 seconds with Kreder now history. Secteur 13, 1700 metres, three stars as Groupama-FDJ and AG2R keep the gas turned up, the trio up front are being kept well under control but with the peloton getting smaller by the minute. 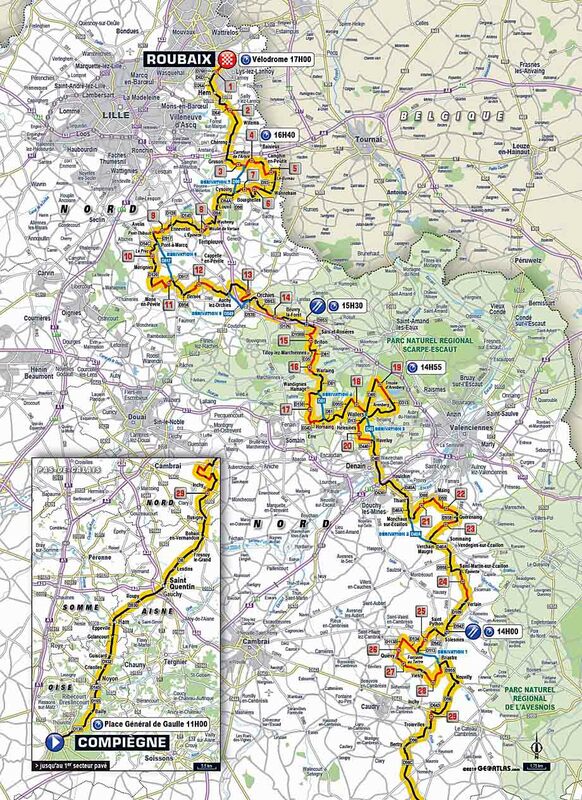 Secteur 12 and the break has 2700 metres to ride; Sagan accelerates to join a bridging move with WVA, Laporte (Cofidis), Vanmarcke (Belgium) and Lampaert. Meanwhiles, up ahead, Selig is gone and drops Politt – PhilGil en seule! Next up is the five star, 3000 metre Secteur 11. Gilbert relaxes a little to wait for the chasers – WVA, Vanmarcke, Sagan, Laporte, Marc Sarreau (Groupama-FDJ), Politt and team mate Lampaert with 48K to go. Laporte pops, Lampaert is strong, dragging the gap out, 35 seconds now. 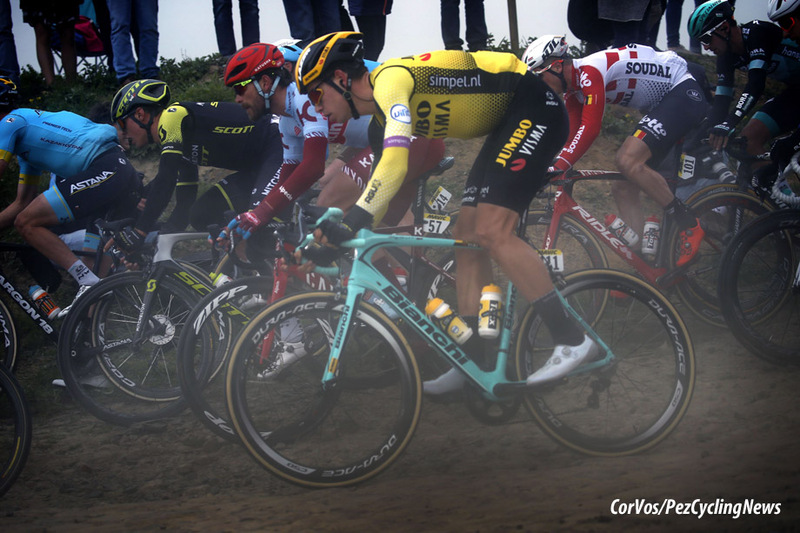 Secteur 10, 700 metres and the six up front are committed; Politt is straining, Lampaert looks strong, Sagan is inscrutable, Vanmarcke a little ragged, WVA must be tired and Gilbert will be calculating. Behind, Senechal and Stybie throw a blanket over anything dangerous. The timing says 51 seconds lead, GVA tries but those damn Deceunincks are everywhere. 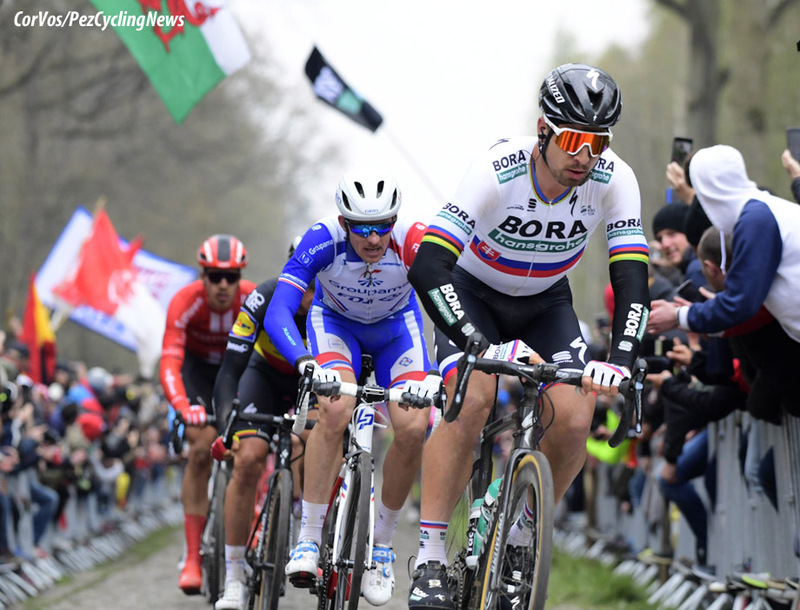 There are 40K to go, it’s the last hour and the break enters Secteur 9 – 1400 metres, Sagan leads and it’s over a minute. GVA drives hard behind; every minute he spends at the front makes it less likely he can win. 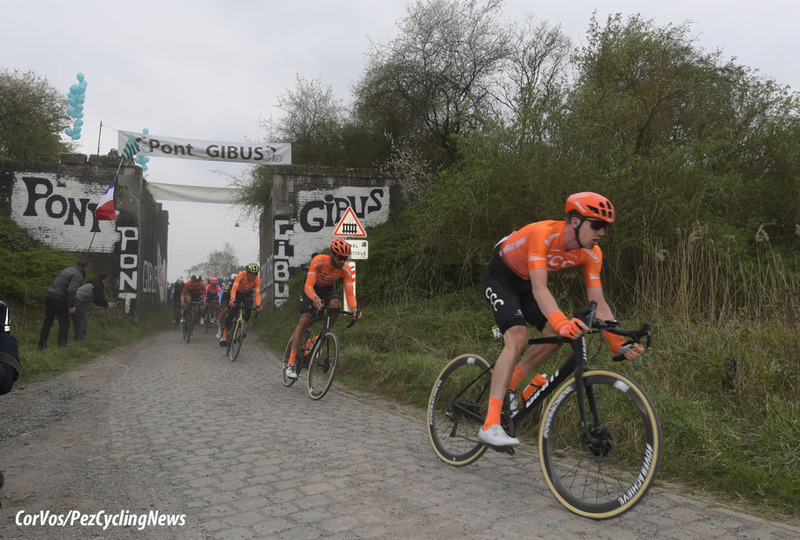 Stan Vandenbergh takes over at the head of the peloton - but even a beast like him will struggle to make inroads into the six men spelling sweetly, ahead. Secteurs 8 b  and a  are next with Lampaert looking very tasty, dragging them through. If Naesen doesn’t make the podium it certainly won’t be Big Stijn’s fault as the big man pummels the pedals at the head of the bunch. So many behind him will be wasted. The lead hovers on the minute; Secteur 7, three stars, 1300 metres as still the six work sweetly. Secteur 6 now with Lampaert so strong. Behind, Vandenbergh drives on and on – what a man. They exit 6, Gilbert attacks, Sagan counters, as does Politt – behind Lampaert plays poker, sits on WVA and Vanmarcke then jumps, he cracks WVA but Vanmarcke goes with him. Three, two and one up the road now. Secteur 5, four stars, 1800 metres and the cross winds are making it tough for everyone. Now it’s five and one as Lampaert and Vanmarcke rejoin on the exit of 5. Secteur 4 next, five stars, 2,100 metres, the Carrefour. Lampaert drives, Sagan looks relaxed, Politt the weakest. Gilbert goes. Sagan counters. Gilbert and Sagan now from Vanmarcke and Politt then a suddenly weak Lampaert. GVA Kills himself behind. 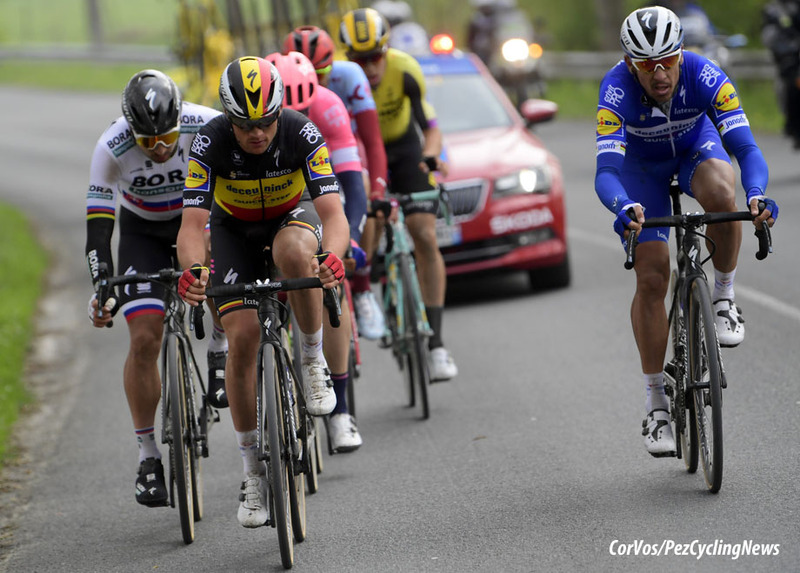 Secteur 3 with Politt attacking, Gilbert marks him, Vanmarcke chases, Lampaert marks the EF man and all of a sudden Sagan’s stuffing is starting to show. 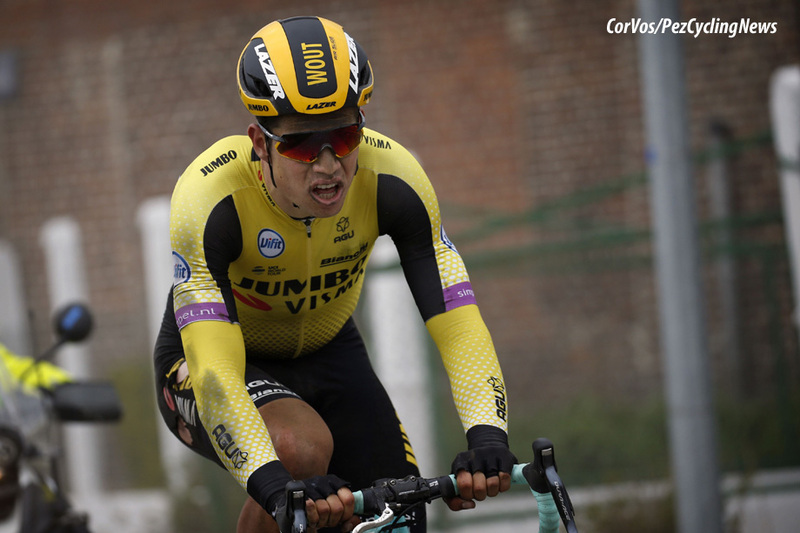 . . Two against three now – Gilbert and Politt play Vanmarcke, Sagan and Lampaert; they have 18 seconds. Secteur 2 coming up, 10K to go and Vanmarcke needs a new bike. 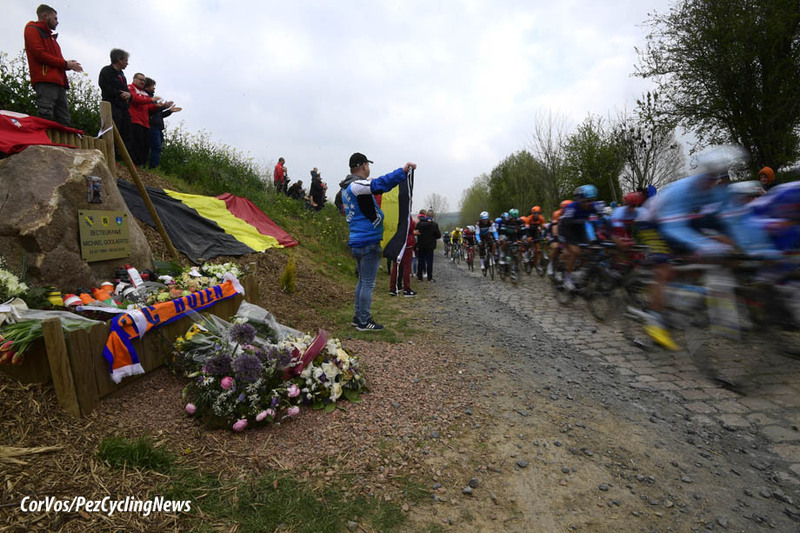 Secteur 2, 1400 metres as they hurtle past pictures of previous winners – there’s Eddy! Gilbert forces it, they have 40 seconds on their erstwhile compadres now. Five K to go now, smooth roads and . . . Sagan pops. Wow! 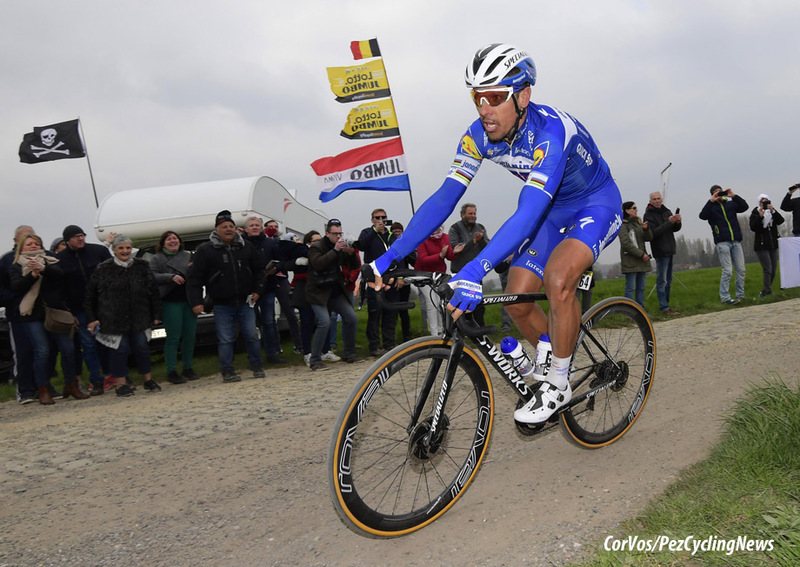 Vanmarcke changes bikes then catches Sagan. 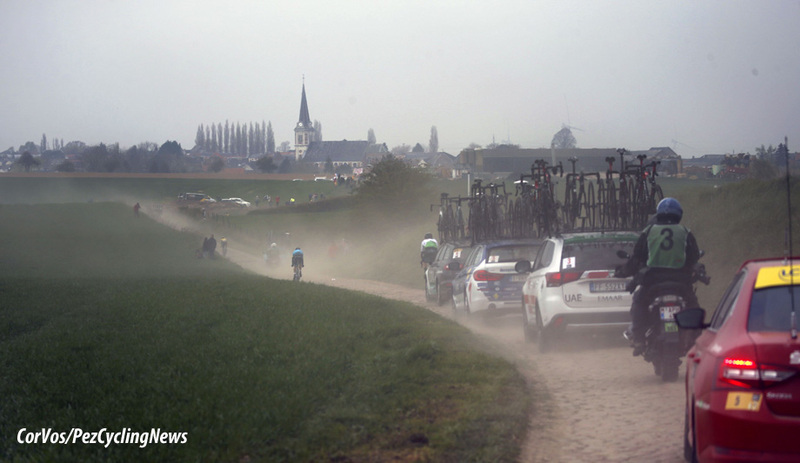 We’re in Roubaix, there’s a drag now up to the kite. 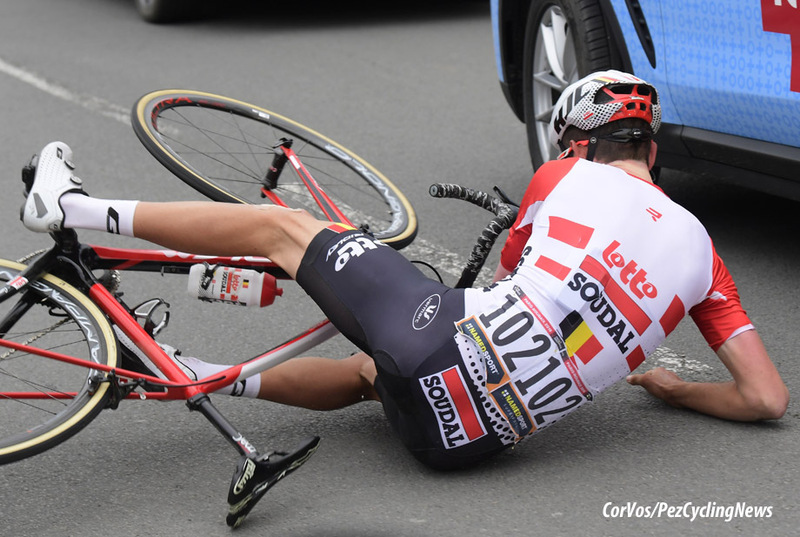 Lampaert is riding hard but is it too far to get up to Gilbert and Politt? 28 seconds and two K to go – it’s possible. . .
Secteur 1, 300 metres of lovely smooth sets – then the velodrome, Lampaert won’t make it but there’ll be two Deceuninck’s on the podium. Politt leads on to the holy concrete, Gilbert tracks him and lets him lead high around the fence until turn four where he dives inside him, has the German anything left ? No! It’s Gilbert! Lampaert takes third and Vanmarcke beats a wasted Sagan for fourth. Monsieur Lefevere embraces his boys – tears flow, no wonder.